One of the closest restaurants to my grandmother’s apartment in Philadelphia is Positano Coast by Aldo Lamberti. Inspired by the beautiful coastal Italian town, Positano offers small plates featuring exciting ingredients prepared in the delectable Italian style. The walls boast floor to ceiling murals of the beautiful sparkling blue ocean and shiny white buildings. There are also many beautifully painted plates adorn the walls along with white summer outfits with blue embroidery. The bar is decorated with tall glass hurricanes filled with whole lemons. I have been coming here for years with my family, and every time I am excited as I walk through the door for the delicious bites I will soon enjoy. This time we visited Positano for my aunt’s birthday. In addition to our mimosas we shared 10 small plates. 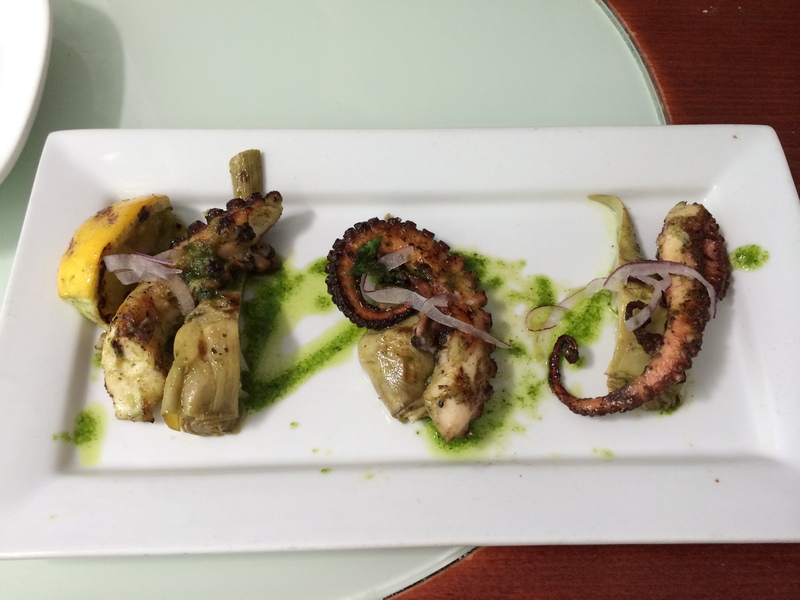 First, grilled octopus with charred artichokes. The octopus tendrils were unbelievably soft and succulent. The char from the grill tasted wonderfully against the acidity of the lemon, which I think was also grilled. The artichokes were soft and a wonderful accompaniment to the meaty octopus. 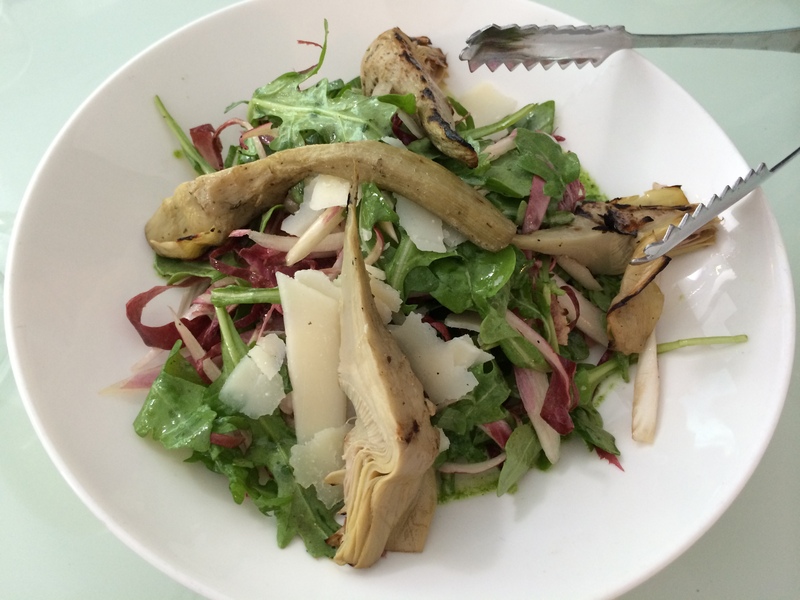 Second, the grilled artichoke salad with red Belgian endive, arugula and shaved parmigiano. The dressing on this salad was extremely light, and I felt that the true flavors of each ingredient on the plate were really able to shine. The arugula was crisp and peppery. The red belgian endive brought a pleasant bitterness to the dish. The artichokes were a bit lighter in flavor than those served with the octopus, but they added a great substance to the dish. Finally, the parmigiano tied the whole salad together. 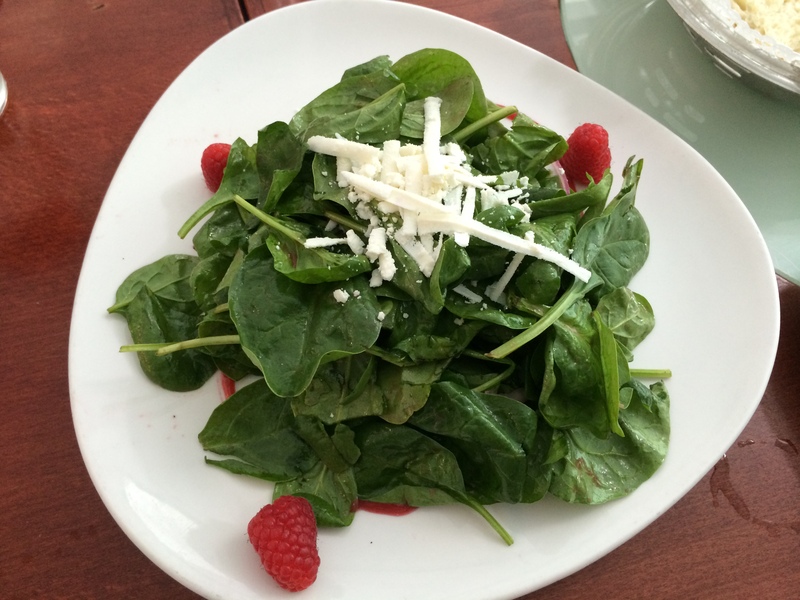 Third, the spinach salad with raspberries, raspberry vinaigrette, and ricotta salata. Another light and pleasing salad. Crisp spinach leaves, light dressing, and saltiness from the cheese. Yum. 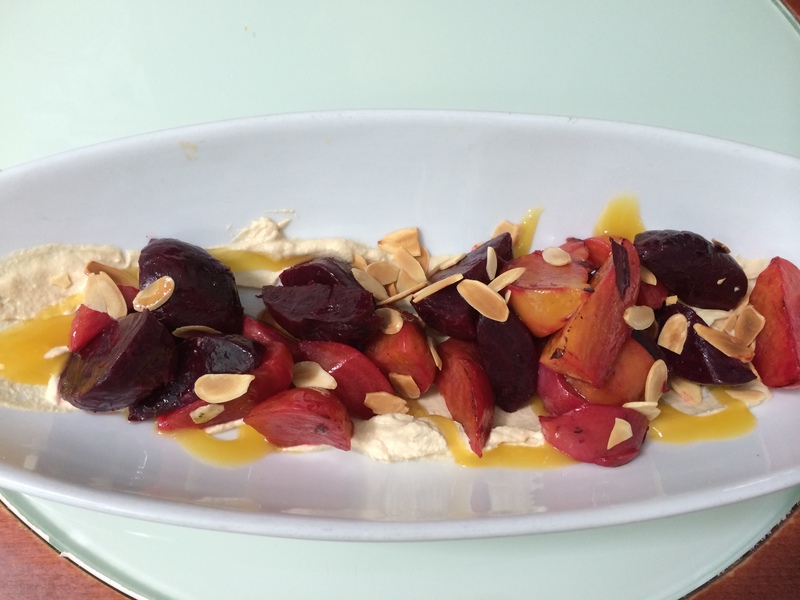 Fourth, roasted beets with almond puree and mango vinaigrette. I love beets so of course I enjoyed this dish. There were three colors of beets – dark red, bright pink, and golden. All were cooked just right. The almond puree was not overwhelming and served as a nice soft base for the beets. The sliced almonds added a nice crunch, and the mango vinaigrette brought a great tropical fruity flavor to the dish. 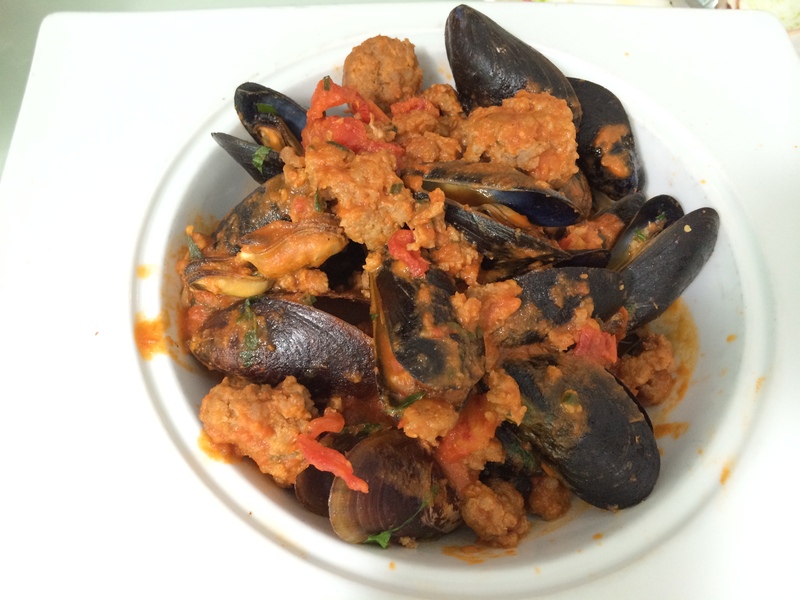 Fifth, Aldo’s Big Mussels – pan-roasted Blue Bay mussels with chorizo, parmesan, sage, and sun-dried tomato broth. Having the big chunks of meat mixed in with the mussels and the sauce was a new way for me to experience mussels, and I must say, I really enjoyed it. 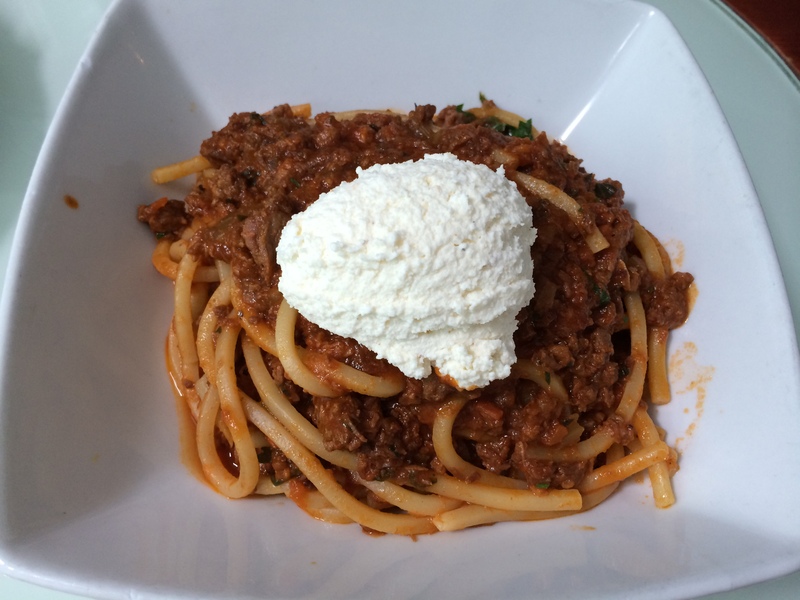 Sixth, the spaghetti alla chitarra – buccatini (thicker spaghetti that is hollow in the middle of the noodle) with the house made bolognese sauce using short rib and steak, topped with house made ricotta. This was my favorite dish of the bunch. The bolognese was meaty and rich, especially after we mixed in the ricotta cheese. The last time I had buccatini was in Rome at a family friend’s grandmother’s house. This definitely brought me back to that amazing meal. I scraped the bottom of the bowl for the remaining sauce after everyone else had finished. 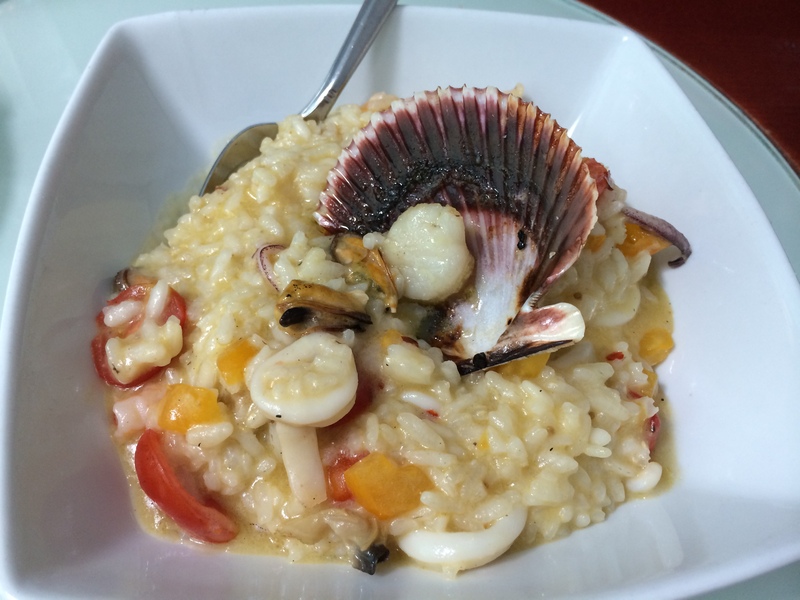 Seventh, the seafood risotto with baby shrimp, clams, mussels, calamari, Peruvian scallop, garlic, and tomatoes. While certainly one of the more visually stunning dishes, this was not as explosive in flavor as I might have expected a seafood risotto to be. The seafood was all cooked well, and there were both red and yellow tomatoes in the mix, but it seemed that there was something missing, something that would have made the dish more seafood-esque. Eighth, mushroom risotto, which was not on the menu but we had had it in the past. Including several different types of mushrooms, a generous amount of cream and cheese, and topped with truffle oil and a sprinkle of parsley, this was a very rich and fulfilling dish. 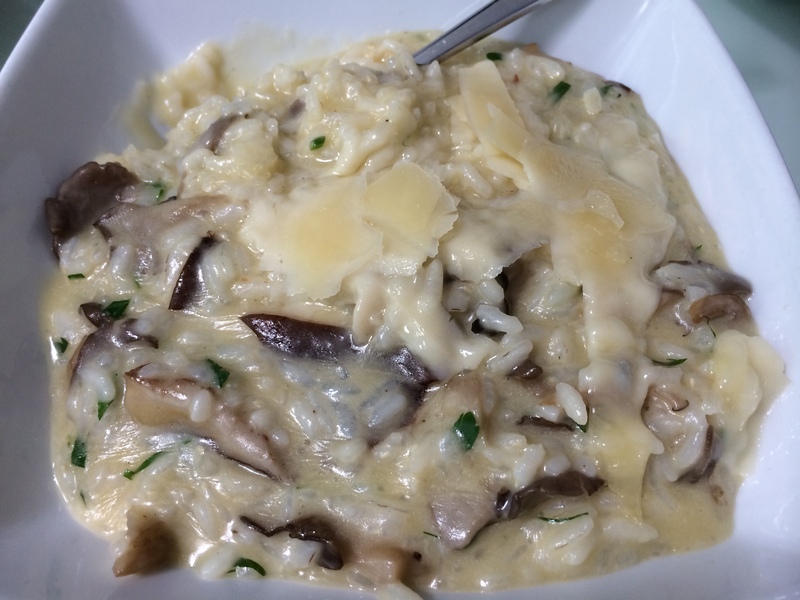 Warm and creamy, this was everything you would want a risotto to be. Ninth, another off-menu item, the gorgonzola gnocchi. 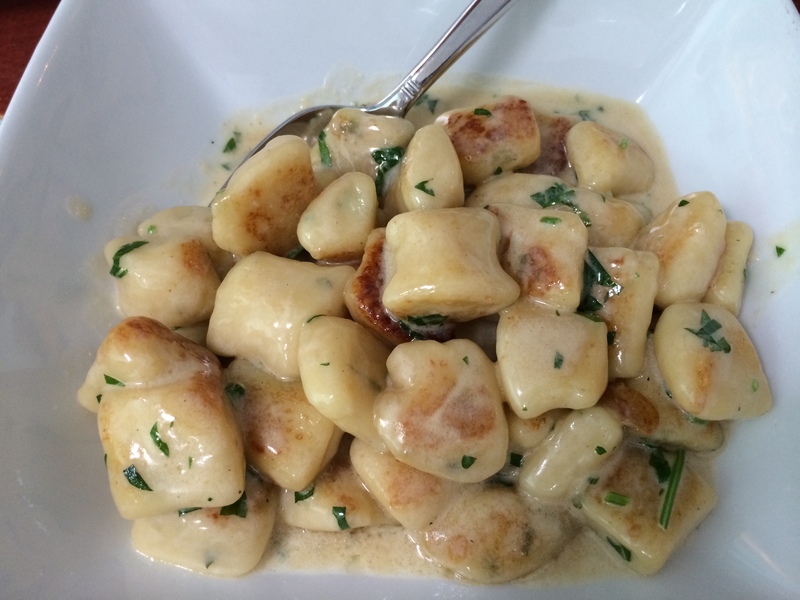 I am always a fan of gnocchi, especially when it has been pan fried, and this did not disappoint. Soft pillows of cheese and dough, caramelized and crispy on one side, what more could you ask for? 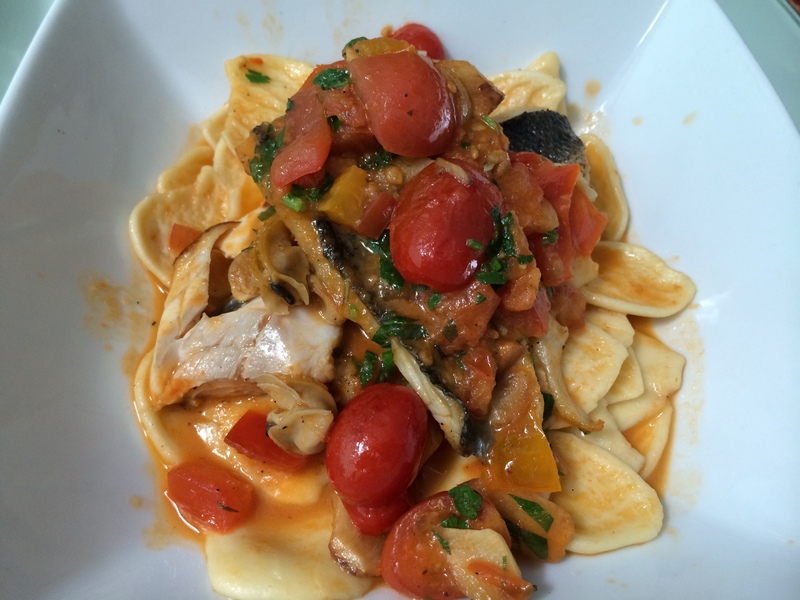 Tenth, and finally, the fresh fish marechiaro, served with garlic, clams, tomatoes, oregano, and strascinati pasta. The fish was soft and tended, but I really enjoyed the large clams with the light tomato sauce. I love cherry tomatoes in sauce, especially with seafood. This birthday lunch was certainly a feast in delicious Italian cuisine. Since it is restaurant week, we were able to try a few dishes from the special menu (artichoke salad and fish marechiaro). I was impressed with their selection and price ($15 for 2 courses), and would definitely recommend this restaurant either for the restaurant week menu or the main menu.